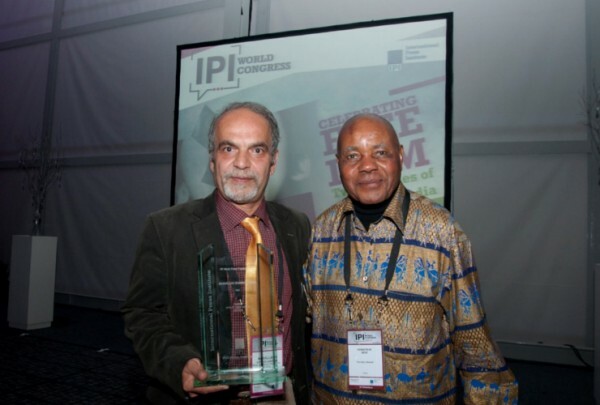 The following remarks were delivered by Morten Østervang of the Copenhagen-based International Media Support (IMS) on behalf of Ahmad Zeidabadi, the International Press Institute (IPI)’s 2016 World Press Freedom Hero, at a gala dinner and awards ceremony at 2016 World Congress in Doha, Qatar on March 19, 2016. Zeidabadi, who is the subject of a travel ban imposed by Iran in response to his reporting, was not able to attend. 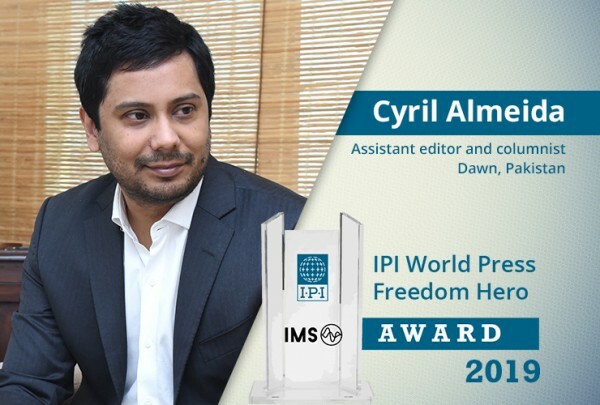 My regards, greetings and gratitude to the directors and employees of the International Press Institute (IPI) and all other organisations and individuals who work to preserve freedom of thought, expression and the pen. I salute all reporters and journalists who – in order to gather accurate information, analyse it, and publish and present it to the world – pay with the security and comfort of life, and that of their family. 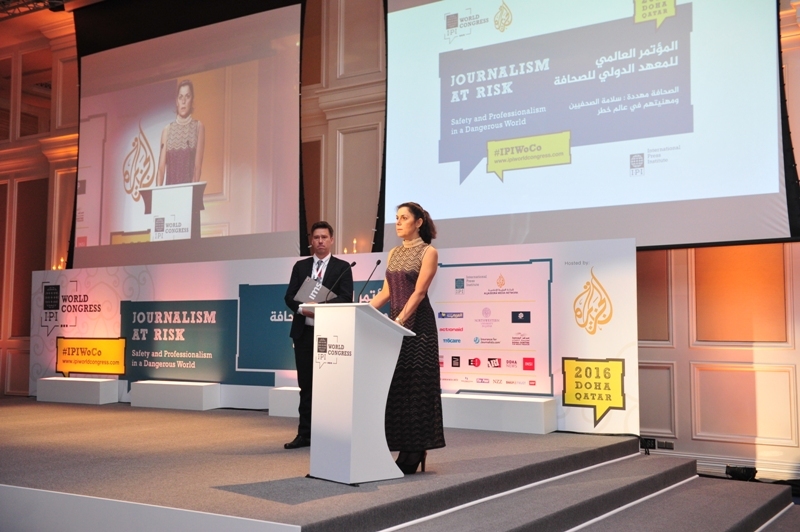 The profession of journalism in my country, Iran is often compared to that of “walking on a minefield”. On the one hand, this comparison might seem an exaggeration, as waves of periodic journalism and heated political discourses have constantly existed in Iran with their ups and downs. On the other hand, the comparison to the minefield does not reflect the difficulties and complications of professional journalism. A minefield has its own logic and rules, and one can avoid stepping on a mine if one is clever enough to use a map and avoid the mines. Journalism in Iran has no official regulation and discipline. For this reason, professional journalists lack security and peace of mind to work consistently and responsibly, and especially to have an impact on the public. In 2000, when I was detained and interrogated for hundreds of hours, I discovered the disrespect of the judiciary and the security apparatus for the press law and other official legislation of the Islamic Republic. I tried to remember the sensibility of these two institutions with respect to the language and the terms used during the interrogation process, and to observe that in my future work. As a result, in 2007, when the five-year ban on my journalistic work ended, I tried to use the experience gained in my 13 months imprisonment and avoid the interrogators’ sensitivities in order to restart my professional journalism. That meant reporting and offering analysis on developments in Iran and the Middle East from a neutral point of view. Using this method of working, I believed I would have a degree of security. This was an incorrect assumption. On 13 June 2009, when I was arrested in front of my home and taken to solitary confinement, I found out that the rule of law in the Islamic Republic lacks any ceiling to cover you even if you crawl under it for security. My detention was presumably related to my activities during the presidential elections, but interrogations were completely focused on my writings in both domestic media and on international websites. Writings, which according to the press regulations of the country, contained no illegal aspect. Despite physical and psychological pressure, I refused to “confess” or “repent” in court or on TV, and therefore the security interrogators brought two accusations against me – “propaganda against the regime” and “gathering and colluding with intent to disturb national security” – and they referred me to the revolutionary court No. 26 presided over by the infamous Judge Pir-Abassi. Pir-Abassi noted in my closed court hearing that there were no special points in my file and my lawyers were certain that I would be cleared of the charges. After serving six years in the Evin and Gohardasht (Rajai Shahr) prisons, I was sent to Gonabad, a small, deserted town. Surprisingly, the people welcomed me with such warmth that the Friday prayer’s Imam and the governor wrote to other authorities demanding my expulsion from the town. Due to these developments, the rest of my exile was pardoned and I returned home after just two months. At present, I am living in my house in Tehran in unwanted isolation. Throughout life, I have learned that enduring silence and imposed isolation can have a high moral virtue, but it is a great injustice to deprive a human being of doing what gives meaning to his life and what he is specialised in. These days, the Middle East is in turmoil and my country is going through stormy upheavals. Naturally, I am keen to express my expert analysis and warn the people of the bogus news published by some powerful political wings. Alas! It seems I am condemned to become a stranger in my own country and have my mouth shut. In such a condition, sometimes I think I have been condemned to “civil execution” or to go through a “silent death” and be forgotten altogether. I may not be frightened of being forgotten. But when suddenly it is announced that an international organisation such as IPI selects “you” as their “World Press Freedom Hero”, and when you remember that throughout the world, your journalist colleagues and other organisations such as the [World Association of Newspapers and News Publishers (WAN-IFRA)], UNESCO and IPI remember that “you” existed and once used to write and offer analysis, this gives you hope that one day you will again be able to write; because our world is sailing faster than ever through its history.